WeGotTickets | Simple, honest ticketing. Read our cookies policy to find out more. Our easy-to-use system makes ticketing and marketing your event easy. Pay nothing, ever. Our system is totally free to event organisers and we offer your customers some of the lowest booking fees around. Complete control of your ticketing from your admin area. Boost your audience reach. Your event will automatically be added to the UK's top listings sites. Find out more. Go green. Our 100% paperless tickets are delivered instantly by email, reducing the carbon footprint of your event. Award winning support. Our award winning Support team handle all your customer enquiries. "We run 10 shows a week and sell over 3500 tickets a month, and WeGotTickets has done a remarkable job. We wouldn't hesitate to recommend them to anyone in the events industry." 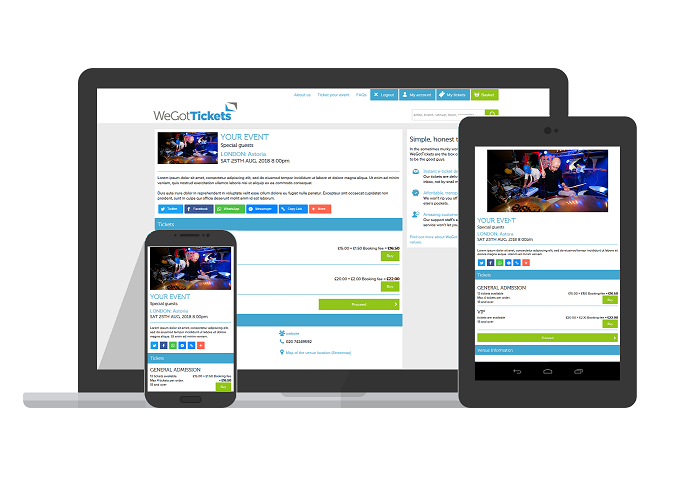 "WeGotTickets are a fantastic agent that keeps booking fees low. There's a person we know on the end of the phone who cares about our needs and our customers." 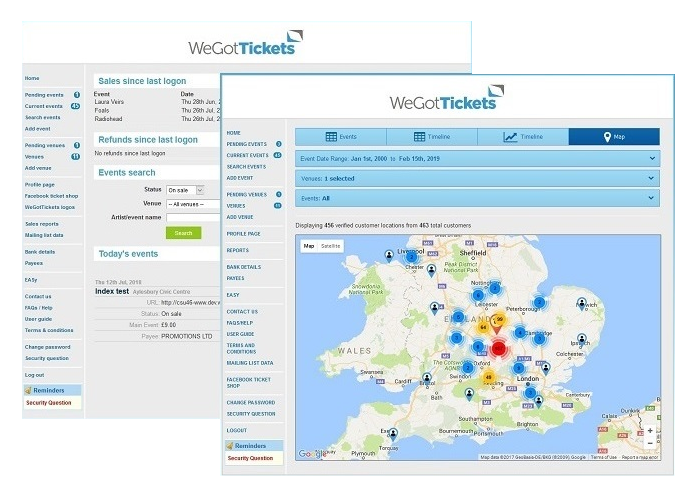 "Our experience of WeGotTickets has always been positive. From ease of use to excellent service and marketing support, we continue to allocate them tickets. Thumbs up!" "The customer service from WeGotTickets is outstanding. Our event listings go up very quickly and they treat our customers as their own." "WeGotTickets' incredible mailshots have helped us sell so many tickets, and are a real testament to the strength of their marketing power." "WeGotTickets are one of our favourite companies to work with. The team's knowledge of live events is second to none and their fantastic marketing support certainly drives sales." "WeGotTickets' staff are helpful and respond promptly, and the system is easy to use for both us and customers. Their newsletters are great, and we usually see a spike in sales when we're featured." "We were looking for an improved box office solution, and WeGotTickets gave us the opportunity to manage our own ticketing. We use them because of their level of support, ease of use, marketing and low booking fees." "WeGotTickets provide extremely personal and efficient service to both our customers at The Nomad and our charity. They have proved an invaluable service, and we couldn't recommend their excellent support more highly." "Thanks to WeGotTickets we can offer Oxjam Music Festival organisers a cheap, easy way to sell tickets. WeGotTickets also kindly provide opportunity for their customers to donate, raising thousands for Oxfam." Social sharing It's easy to share all your events across a range of social media sites. Customers using these buttons will help grow your audience. Mobile optimised Customers will enjoy a simple ticket buying experience on all platforms. Extended reach Listing your event with us will help you reach millions of event lovers who browse WeGotTickets and our affiliate partners, such as Ents24, Songkick, and Bandsintown, every day. More info. Easy to use Our intuitive system makes it quick and simple to add your events. Complete control Your comprehensive and secure admin area means you're always in control. Edit events, amend stock and download reports 24 hours a day. Sales reports Whether you're after at-a-glance sales figures or detailed reports, we've got it all. Download and review your reports at the touch of a button. Here to help Your admin area features loads of great advice, and if you're ever stuck our award winning Support team are here to help seven days a week. We offer the same great service to every event organiser. Whether you're running an event for 20 people, a festival admitting thousands or anything in between, you'll have access to all our bells and whistles, receive award winning support, and enjoy the same booking fee structure — one of the lowest in UK ticketing. We pride ourselves on the exemplary support we provide to you and your customers. We're always happy to field any queries you or your customers may have and unlike many other ticket agents we go out of our way to provide a great ticket buying experience. You can monitor sales and manage your ticket stock in real time, 24 hours a day via your Client Admin area. If you want those sales summaries in your inbox as well we can set up reports that reach you automatically as and when you need them. Want to know whether your tickets sell best in the first week or the last? Or target your marketing at the regions you sell best in? No problem; our in-depth sales reports give you all this data and more for your whole account or filtered by venue, event, etc. Your payment will reach you on the Friday in the week following your event taking place. Payments are made automatically so there's no need to invoice us - we'll even send you a comprehensive payment summary email each week when a payment is due. Our system makes light work of complex ticketing requirements. If your event or festival needs one ticket to be dependent on the purchase of another - no kids without an adult, camping tickets only with weekend tickets etc - then WeGotTickets is the outlet for you. Don't want your customers to pay a booking fee? No problem. 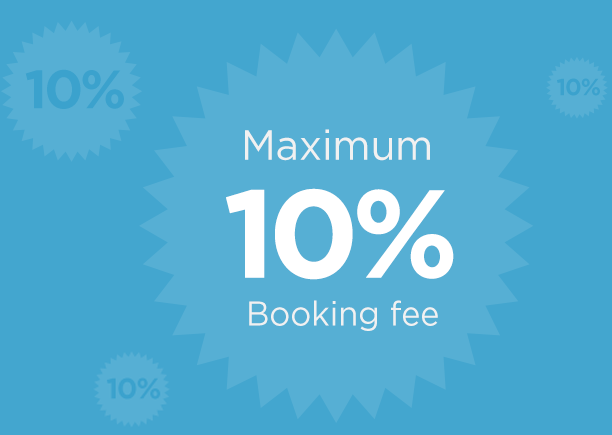 Our system makes it easy for you to subsidise some or all of the booking fee so your customers pay less. If you're running a big series of similar events then we can upload those for you in one simple procedure. This is a precious time saver for weekly club nights, theatre productions and other events with repeat performances. This facility helps you run promotions by offering discounted tickets to select groups, accessible only with your chosen promo code. Need some more information from your ticket buyers? We can add a customer questionnaire to your events which enables you to gather valuable information during the ticket buying process. If you support a charity or are running a fundraising event, we can give your customers the option to add a donation to your chosen charity at the point of purchase. This has proven to be an invaluable revenue stream for many of our clients in the charity sector. Our barcodes are compatible with all major ticketing and venue solutions, making it easy to manage admissions for sales from multiple outlets. They can be scanned on any mobile or tablet, as well as stand-alone laser scanners. This alternative to our standard booking reference system helps to manage multiple access points and speed up entry to big events. Get in touch to discuss our access control options. Your home on WeGotTickets. We'll give you a dedicated URL featuring your branding - including profile and cover images - and all your events currently on sale. Your user friendly URL will be perfect for both print and online. Want to contact your customers? You can easily download your opt-in customer data via your Client Admin area, which will include all customers for your events that are happy to hear from you. Sell tickets directly from your Facebook Page using our Ticket Shop app. It's really easy to set up and automatically adds your events as you put them on sale with us. This app has helped thousands of our clients make the most of their Facebook promotions. We've built up a dedicated following on Facebook, Twitter and Instagram and are happy to share some events with those communities. We can even run special features or competitions, giving your event a huge boost in exposure and ticket sales. Our Marketing department will work with you to find ways to target your event at interested customers through our regional mailshots and focused emails. With exceptional engagement rates, these mailshots can give your sales a big lift. We've partnered with many of the UK's top listing sites and apps, including Songkick, Ents24, Bandsintown, Safe Concerts and the best regional and genre specific sites. Add an event with us and you're also listing it with our affiliates, helping you reach a much wider audience. Find out more. Our maximum 10% booking fee helped drive down the industry average from a whopping 25-30% when we entered the market just after the millennium. We're honest about what our fees are for and where they go, and have established great goodwill in the industry and among the ticket buying public for our practices in this area. We even advised Which? in the formative stages of their 2014 Play Fair On Ticket Fees campaign. We pride ourselves on working in an ethical manner and have campaigned against immoral secondary ticketing practices and inflated prices, also developing a tout-proof reallocation system for our customers. We've advised an All Party Parliamentary Group on Ticketing, spoke at industry events, and given interviews to leading publications to help facilitate change and continue to work to make sure your events aren't abused by this sector. We've been the Official Ticketing Partner of Oxfam's Oxjam Festival since 2008. As well as providing ticketing services for thousands of their events and a fully branded ticketing site for the whole festival, we've also helped recruit and train thousands of fundraising event organisers and contributed over £25,000 in booking fee and customer donations. In addition to our work with Oxfam we've set up links with some of our other favourite charities and are delighted to have worked on special campaigns for our friends at War Child, the Disasters Emergency Committee, Macmillan Cancer Support, Youth Music and many others, raising tens of thousands of pounds for the great work they do. Our ticket system is environmentally friendly and is the ideal partner for the carbon conscious event organiser. A study published in March 2013 shows that a paper ticket sent in the post emits over 1000 times more carbon than our system when the email is not printed - meaning we could ticket Glastonbury and emit less carbon than a paper ticketed event at your local 200 capacity venue! We'll never charge you a penny. No set-up costs, no monthly fees, no credit card charges - nothing. Customers pay a booking fee that's just 10% of the ticket price; less for tickets over £25.99. VAT is included and there are no other fixed fees or service charges. If you think you've found a company offering lower booking fees — check the small print! You receive the full face value ticket price.